Yahoo! 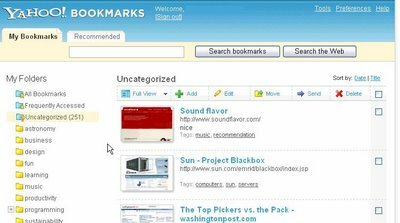 Bookmarks, a venerable bookmarking product that most users probably have never heard of, is getting a new look. Compared with the current version, the beta is significantly better and is intended to replace Yahoo's MyWeb social bookmarking service. It's slicker and uses AJAX to good effect to create an interactive UI. Developer Tom Chi has a screencast of the new product here. The all new Yahoo! Bookmarks will focus on personal saving, organization, and recovery while our comrades at del.icio.us will concentrate on meeting your social bookmarking and sharing needs. For users of MyWeb, your bookmarks are safe, and in a few months you'll be able to roll over to either Yahoo! Bookmarks or del.icio.us. We'll explain this process more thoroughly in future posts. Users of the Internet Explorer-based Yahoo! Toolbar will be able to upgrade to the new version that integrates Yahoo! Bookmarks via one-click bookmarking of a site and also features find-as-you-type bookmark searching.